Vigyantaram IIT Bombay - T.I.M.E. Schools - Bringing the best CBSE education in Hyderabad and Secunderabad. Top Hyderabad Schools with CBSE Syllabi. Students of T.I.M.E. 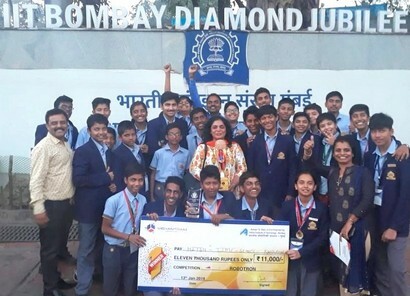 School Kandlakoya, Hyderabad have won the National Robotron Championship conducted jointly by Vigyantaram & IIT Bombay held at IIT Bombay campus on January 12 & 13, 2019. Competing against 300 students representing over 38 schools from Chandigarh,Kanpur,Nagpur,Delhi,Gurgaon and many more regions across India, team fromT.I.M.E.School Kandlakoya comprising of Akshata S, Madhavan, V. Harshit Raj, Kanishk Sharma lead by team leader Nitin Remella won the first place. Competition included both theory and activity wherein the robots built by the students had to complete specific tasks like playing football, tracing a maze etc. The team score highest in all the three rounds i.e.-Written test,Practicals like playing football and clearing obstruction. The students have also won a Cash prize of Rs 11000/- other than the two trophies. T.I.M.E. School Kandlakoya also won the best Zonal School Award for their pioneering effect in inculcating innovative spirit in their students. Commenting on the occasion, Mrs.Vijaya Sudhakar, Principal, T.I.M.E. School Kandlakoya said, "It is a proud moment for the students and also for the school. We as an institution believe in inculcating a Scientific temoeramnet and spirit in our students. We believe there is a world beyond academics, which the students need to explore to tap their hidden talents and help build a better world. It is among the many steps we are taking inshaping the world and life of our students."